Product prices and availability are accurate as of 2019-04-20 10:54:16 UTC and are subject to change. Any price and availability information displayed on http://www.amazon.com/ at the time of purchase will apply to the purchase of this product. WICKED, STARRING KRISTIN CHENOWETH, IDINA MENZEL AND JOEL GREY. 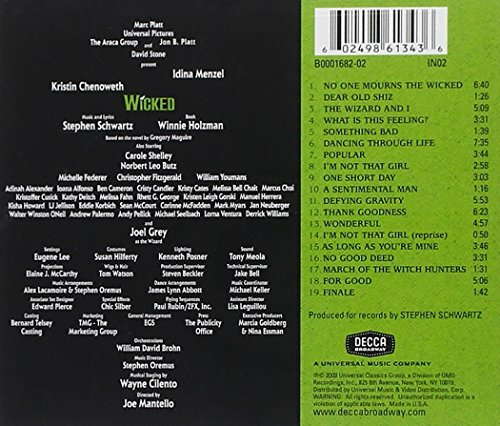 Decca Broadway proudly presents the original cast recording of WICKED, Broadway's most talked about new musical. The box office is already over $10 Million! With a score by Stephen Schwartz (Broadway's Pippin, Godspell), libretto by Winnie Holzman (TV's My So-Called Life) and based on the best-selling novel by Gregory Maguire, the musical is a prequel to the legendary classic, THE WIZARD OF OZ. WICKED explores the early life of the witches of Oz: Glinda and Elphaba. One witch, born with emerald green skin, is smart, fiery and misunderstood. The other is beautiful, ambitious and very popular. 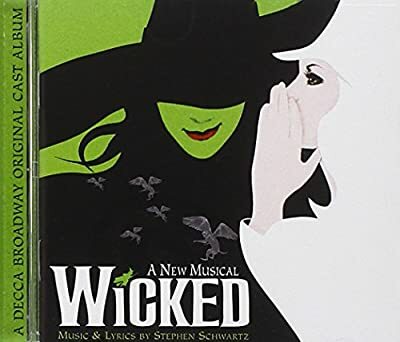 WICKED stars Tony Award® winner Kristin Chenoweth (You're A Good Man, Charlie Brown) as Glinda, Idina Menzel (Rent) as Elphaba, the Wicked Witch of the West, and Tony® and Oscar® Winner Joel Grey (Cabaret) as The Wizard. The Original Cast Recording -- featuring an essay by Wicked novelist Gregory Maguire, original color photos from the show and a complete libretto.